"Charging out of the great American Northwest comes Mudd the Moose™. 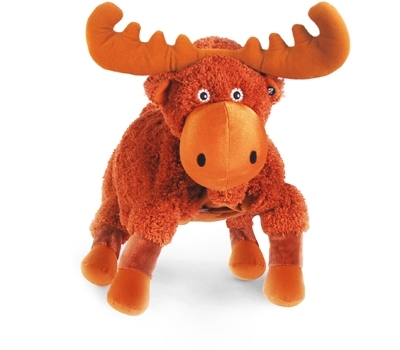 This super-adorable Blanket Pet™ is a big softy: from his plush hooves to his cuddly antlers. 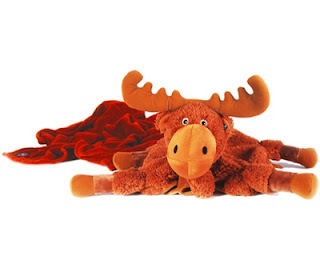 Bound to become your child's best friend, Mudd™ is not only an adorable moose, but also a comfy pillow and super-soft blanket all in one. Perfect for road excursions or just cuddling in bed." What we thought: D is in love with Mudd:) When the package arrived, he immediately wrapped up in the cozy warm blanket and snuggled up with the moose:) He sleeps with this guy every night and Mudd has already made a couple of road trips with us. We go up to Austin once or twice a month to visit family and this Zoobies Blanket Pet is perfect for travelling! The blanket is surprisingly large and folds up into a zippered pocket that is the animal's body. D can use his moose as a pillow, a blanket or just a buddy:) Zoobies would be great for sleepovers or nap time at daycare. The variety of animals at Zoobies is sure to please everyone...they even have cartoon and storybook characters! ABCD Diaries gives Zoobies an A+! Buy It: You can find these fun Blanket Pets at Zoobies! Use the coupon code “Parenthood” on the website for 20% off any Zoobie product! Win It: Zoobies has generously offered one ABCD Diaries reader a blanket pet! To enter, follow our blog via GFC and like Zoobies on Facebook...then comment below. Giveaway ends Friday, August 26, 2011 at 11:59cst. Winner will be chosen via random.org and emailed. They will have 48 hours to reply. Open to US residents 18+:) No PO Boxes. Disclosure: ABCD Diaries was given a Zoobies Blanket Pet for review purposes only. We were in no other way compensated. The opinions expressed in this post are ours and ours alone. GFC & Tawnda M like Zoobies on Facebook. Like" ABCD Diaries via Facebook. Follow ABCD Diaries via Twitter. Entered Lay's Regional Potato Chips giveaway. I follow via GFC, and like zoobies on fb. I like Zoobies on FB as Kelly Ann T and I follow you on GFC as cstironkat. I follow your blog with GFC and like Zoobies on Facebook (Jason Rubio). I subscribe to your blog #2. I follow via GFC and like Zoobies on FB! GFC Follower - Gina F.